Seth accepted a new job. Two hours away. We must sell the house. We have five kids. And a puppy. And we home school. That means that we are at home all of the time. Except when someone wants to look at the house. The sheer volume of work required to keep our house immaculate is keeping me from blogging. Or emailing. Or reading. Or doing anything that would normally be relaxing. So, I haven't left the bloggy world, I've just joined the house selling world. I would really love to leave the house selling world. It's an unpleasant place to visit. I hope our visit isn't too long, it's been three weeks and I'm about to pull my hair out. On Sunday afternoon we had another showing. Seth was suffering for the government in Florida, so I alone, ran like crazy for two hours. I loaded everyone (including puppy) into the van and ran back into the house to do my last check. I spotted my coffee sitting on the counter (a treat for the road) and the two cats sitting next to a pile of cat vomit. They were staring at each other as if accusing one another of violating my newly scrubbed floors. I cleaned that up and grabbed a loose dog toy that had escaped my grasp earlier. As I threw open the front door, huge dog crate in one hand, coffee precariously balanced on top of the crate and keys in the other hand. There were three strangers standing on my porch examining my front door--the stinking realtor was 15 minutes early. Here I am, Ms Frizzle meets Amelia Bedelia nearly bowling them over with a dog crate. So we didn't hear back from that realtor. Sigh. We could live in this horrid house selling world for a long, long time. Which means I won't be blogging very often. It seems impossible to believe, but Ella has turned seven! "Ella, What do you want to do for your birthday? Do you want to have a party at home or somewhere else?" (Fully expecting her to say Chuck E Cheese, I laughed when I heard her reply). "Well, I guess we could have it at Maggie's house." She innocently said this like she was helping me by allowing Maggie's mom to throw the party. As if we could rent their house for the birthday. 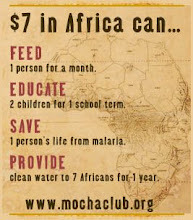 Not a bad money making scheme if you are willing to drive yourself to insanity. "Okay, well, we can just have it at home. What kind of party do you want?" Groan. Four years of princesses means I'm out of creative princessy ideas. "How about something else this year?" "Okay, how about a movie party and we just watch movies the whole time?" Ella has a little bit of a TV obsession. Just a *little* one. "How about you just show up and I'll plan the party?" "Okay. Make sure I have a cake and pinata." So we did a tea party and had all the girls bring their favorite dolls. Then read "The Best Loved Doll" since I was the planner and I have a *little* book obsession. It's an oldie but a goodie and if you have a little girl who hasn't heard the story you should just be ashamed of yourself. Ella suddenly looks the part of a seven year old. Her adult teeth have grown in and she had her ears pierced as a birthday present. This was a huge step for her as she has vowed never to pierce her ears because "that hurts". Her little sister goaded her so much that she relented and is quite happy with the result. Happy Birthday, big girl! A few weeks before Sally's surgery, we got a phone call from America World regarding a video they wanted to make to encourage families to adopt. We were more than willing to participate, but wondered if seeing a little girl in a body cast would actually encourage anyone to embark on this crazy journey. I talked to Mike at America World and explained the situation, but they still wanted us to come. Out of desperation, perhaps, but we are always looking for an opportunity to be in the limelight. We should never be in front of an audience because I hear ridiculous things trickling out of my mouth. Usually I can't stop myself and then feel like an idiot because I just said that out loud, didn't I? With great satisfaction I can say that I tried desperately to limit my speaking while we were being taped. That's really hard for a big mouth like me. It worked though, because Seth spoke more and in the end, he was the one who actually said, "Adoption. It's an amazing adventure." That didn't make the cut, but it will be a long time before he lives that cheese down. He can thank me for that. It seems tremendous to do a 2 minute short trying to explain why people decide to adopt and how it really isn't impossible and that indeed 'those kids' really will be 'your kids' one day. 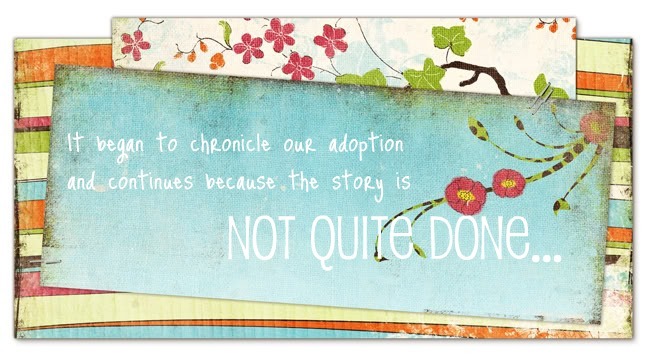 But, hey, adoption is an amazing adventure, isn't it? Josiah is trying so hard to talk. We all try to understand him, but at times it's impossible. For over a week he's been pulling me into the kitchen and pointing to the cupboard then yelling pleading with me for "Batah". I open the cupboard and give him one of his snacks. He's usually disgruntled and feeds it to the dog. I have no clue what he's wanted until yesterday. I was making baked ziti for dinner. Sally and Ella were lurking in the kitchen, as usual. Manny was on the rug at my feet, as usual. Josiah was yelling, "Batah!" and I was getting flustered. Not without reason, I think. Both of the girls were asking me questions about dinner and I finally said, "It's pasta just look in the oven." Then I clicked the oven light on. Josiah ran over to the door and screamed, "Batah!!"